ATTENTION: This is a thorough revision and update of an earlier page. It is one of the most important pages of this website in which the fundamentals of the mathematical model and all the crucial archaeology is contained, but it is a work in progress because I am not satisfied with the outcomes of Stenness and Stonehenge yet. 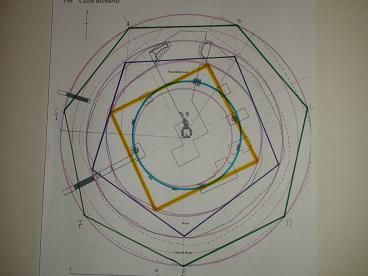 The scientific data on the megalithic works, translated into the mathematical measurement model here employed, together with the design of the works, form the keys to a natural-number logic and its geometry, which seem to have been understood and employed by the megalithic builders. Although the model is basically simple as a toddler’s maths it is also confusing especially for those who are not used to mathematics anymore, so it may seem very tough still. It, though, nowhere goes beyond the most basic geometrical truths which most must remember from school and the model is a joy of simplicity and transparency once you know how it works. You don’t have to learn something new, only remember what you already know. 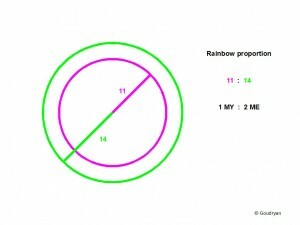 The only numbers involved are 11, 10, 9, 8 and 7 and their multiples (esp. 14), so when Stone Age people could do it, why can’t you? 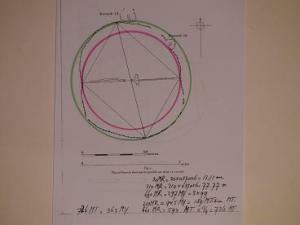 Here I give initially only the data which relate to the ratios of several of the most important stone circles in the British Isles and the design of three buildings. (Brodgar, Stenness, Maeshowe: all in Orkney; Stonehenge , Avebury in Wiltshire; Newgrange, Knowth in Ireland). The data reveal an underlying geometry of whole numbers and a recurring use of the same measures and ratios as has been shown elsewhere (see The Numbers). 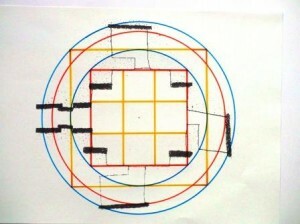 The most important fact is probably the discovery of the square by Neolithic man and its relation to the circle. 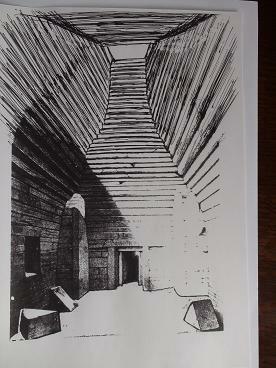 This knowledge got immortalized in the design of Maeshowe. The present mathematical theorem is indeed, among many other things, about squaring the circle, but not by the usual area, but by circumference, which is quite a different story. The numerical ratios are based on four units of length which have definite ratios between themselves (see Bone Measures). 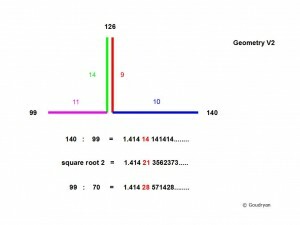 To appreciate these ratios, like the differing values for Pi, one should notice that the same values are returning again and again, sometimes halved, sometimes doubled, sometimes quadrupled or more, in different units; this is what makes it confusing and where also I make sometimes mistakes. (I hope I have weeded them out now, but things are clearer, more visible in The Numbers). The aim is to show that all these (stone) circles in design are mathematically interrelated and that they themselves in fact express the basic ratios and principles of the geometries and of the logically consistent theorem, which is applied. It is not impossible that every stone circle by its size and number of stones expressed a notable date in the calendar. It is the Neolithic Cosmic Order, the Celestial Ratios, with the Rainbow Proportion at its heart. The great Newgrange chamber, appears to stand on its own, and seems made up of triangles and a (skewed) hexagon, but is also much earlier than the others and possibly the spiritual source. The picture shows a solution to AB Powell’s (1994) observation that kerb-stone K-67 seems a lonely decorated stone, but this picture now also includes the decorated K-83 and K-84. Note that all these yellow lines are of exactly equal length, but this is probably ‘accidental’ in the eyes of our professionally ‘sceptic’ scientists. In Orkney we find mathematical and geometrical statements pur sang. Most of the data here used come from A. Burl’s books on stone circles, if otherwise, the names are mentioned. 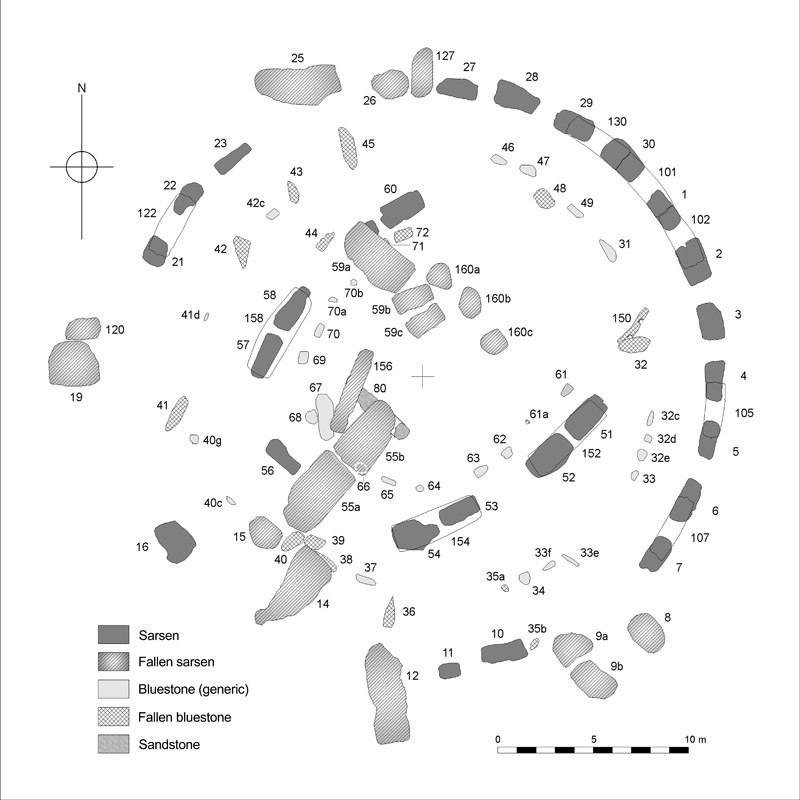 In some cases there are no data, but these are then derived by measuring the official professional excavation plans, which always have scales, as with Stones of Stenness, or they are hypothetical design inferences as with the non existing bank of Brodgar and the height of Maes Howe. Given are also the values of the Egyptian Royal Cubit and the Remen of the Great Pyramid to point out the striking resemblances of the used units and the resulting geometries and to show that several key values of Brodgar are incorporated in two Giza Pyramids! (Brodgar is most probably earlier or contemporaneous.) These will eventually be illustrated by pictograms. Considering the often huge and rough building material, the ‘average’ nature of all data, the mix of feet and metre values, plus the rounding off in decimetres (Burl), I propose every value differing from the official data within 5 cm/2 inch in circles or 2cm/1 inch in buildings of over 100m, to be ‘exact’, whereas there are also differences caused by my consequent use of the Pi-factor: 22/7, which mathematically can exceed some 10 cm in big circumferences (Brodgar), but in reality are trivial because of the width of the stones; still most outcomes are much more precise, up to really exact. The model is inherently imprecise, because it only uses whole numbers, but this evens out, as has been shown (Rationalizing the Ir-rational), differences of less than a thousandth are considered irrelevant due to the materials used or in connection with the tolerance of resonance; the theorem is logically totally consistent on the basis of its parameters, it are its practicality and ingenuity that stand out; it is a joy to work with because of its inherent transparency and beauty. The Remen is taken as concept of a unit of length which has a square root 2 relation to a basic unit, in this case the Megalithic Ell, to overcome the ir-rationality of the length relationships. It should be noticed here that A.Thom’s diameter is 125 MY, whereas mine is 126 MY, because of the 6.2mm difference in the units. In the data for Stonehenge and other sites my MYard-unit length (.8228m) always fits better, even with regard to Thom’s own data, and produces mathematically meaningful numbers. 126 (=9×14)is the key to the mathematical model as is also shown in the height of the theoretical prototype, the 3rd Pyramid, 126 RC.(65.97m). Thom’s 125MY diameter has no meaning and does not render a circumference in whole numbers either, for yards, nor for rods. Twice this length (2 x 51.835) = 103.67m seems to be a crucial length. It is the heart of the Stone Age mathematical model. We see the differences are not over 2cm! 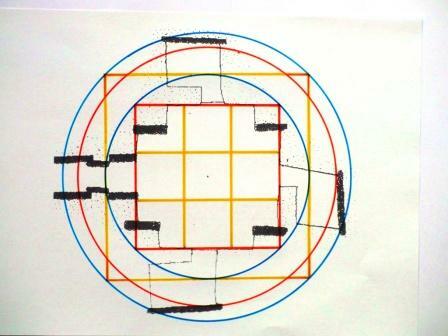 Maes Howe is not exactly square at floor level, which is due to the placement of the 4 ‘standing’ stones inside which indicate converging lines (intersection Barnhouse stone? ), which may have been deemed more important than the exactness of the abstract cube, the roof construction though is definitely square beyond the buttresses! It is supposed that a (rough) cube of 8 Megalithic Remen was indicated by the edges of the 4 buttress-standing stones and by the supposedly flat-topped buttresses, having the height of the tallest upright; the cube has a floor diagonal of 8 Megalithic Ell between the buttresses (in reality only ‘exact’ between East and West buttress). 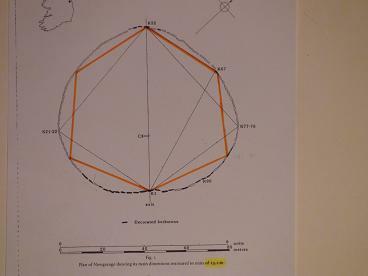 I laser-measured 4 stones at 15.84m radius from one centre, SW-corner hearth, makes 31.68m diameter (Burl 31.70m), for half of the circle, this is exactly 77 Megalithic Tibia or 38.5 MY , the other half may be on a smaller circle, anyway 77 x 22/7 gives inner circumference of 242 MTibia = 121 MY (= 11 squared). Remember this regards the inner faces of the stones, when we add thickness more values emerge. They probably sought to incorporate as much information as possible, the spacing between the 12 stones, which is very regular, is then just over 10MY (121:12), whereas only 11 stones were eventually placed, it seems. (but the excavators may have missed one stone hole on a hair-breadth in excavation because it is on a smaller circle, not on an oval). The last two values are: a conjecture (mid-bank) and a value derived from measuring the excavation plan (Richards). 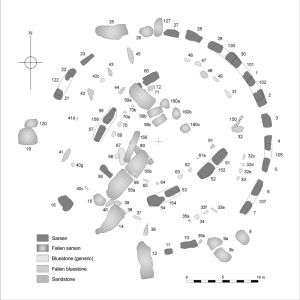 The stone circle is not exactly concentric with the henge circles (see picture) and seems to have two centres, because at least 4 stones are on one perfect circle covering the west side of the ring with the other three within the margins, the east side (5 stones) could be on a different smaller circle, it is not an oval, but this seems deliberate possibly for acoustic reasons, it is though perfect in its spacing for 12 stones. Stenness may have been designed specifically to produce certain echos (in winter? ), it still has a definite echo in the centre, (mind you, with only 3 and a half stone standing!) which may also have held for Brodgar (in summer?) where the spacing is irregular but the circle near perfect. The speed of sound changes with temperature, Stenness is optimal at minus -20C in winter, Brodgar at +25C in summer, so we have a winter and a summer circle, which relate well with the Moon and Sun circle folklore of Orkney. Next we come to Stonehenge where we will see that crucial data from megalithic Orkney return in the sarsen ring and that the ratios again completely fit the model. Lintel ring inner diameter : 81 MR = 29.99 m ? 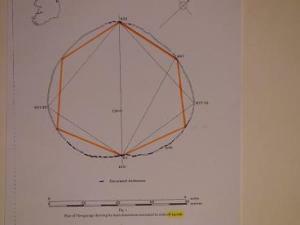 Outer diameter sarsen circle : 86 MR = 31.84 m this is an adequate value for the diameter of the ring of Stenness! Outer perimeter lintel ring : 270 MR = 99.97 m (270/30=9MR, so for the outer arch of the lintels= 3.33m is the length of a segment, this is the radius of the circle circumscribing the ground square of Maeshowe, because the diameter of the square of 4.71m is 6.66m! Note here A. Thom had 45 and 48 Meg. Rods for the inner and outer circumference of the lintel ring which is resp. 93.26m (mine 94.24m) and 99.48m (mine 99.97m) with diameters resp. 29.69m and 31.67m, which would result in a lintel width of 31.67-29.69= 1.98 divided by 2 is 99cm, which cannot be correct either, since the sarsens are 3-4ft (90-120cm) thick and the lintels match them. It seems the lintels have no standard width! This still does not say anthing about the original design, because that is what we are really interested in. The available material brought on the limitations! I hope though to find the clue in the measurements of the Orkney sites. Work in progress! Here my units exactly fit Thom’s own measurements, better than his yard or rod, (his prime 131 (rod) for the perimeter of Stonehenge has no mathematical or calendrical meaning whatsoever), the same holds for most other measures (Thom’s yard does not fit diameter nor inner perimeter of Stonehenge!) my units simply fit better and are always mathematically meaningful. Pi = 2 MY : 1 ME = 22 : 7 !!!!! What is astonishing about this is that the two units of measurement obviously seem to have been used in Ireland at a very early date and possibly came to Britain via Orkney (although no firm data are available for Orkney). It also suggests that the ultimate basic value is indeed the male ulna bone of 26.18 cm (male height 1.73m), this would multiply all the above values with 2, so we get 300, 250, 200, 150, 100, 50 and 25 ulna lengths in the design of Newgrange, which seems to employ triangles of the above ratios! The supposed close cultural relationship of the Maes Howe and Boyne Valley cultures seems ever more likely on the basis of the now available data. Knowth would have been set out in (female) fibula units of 30 x .37025 = 11.11m in my view, whereas according to AB Powell it is an 11.10m standard measure. 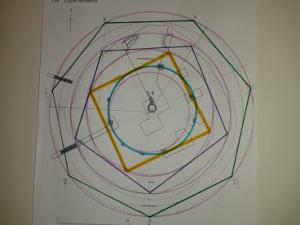 The picture shows again in analysis a Rainbow proportion, here in the triangles that make up the inner lozenge. 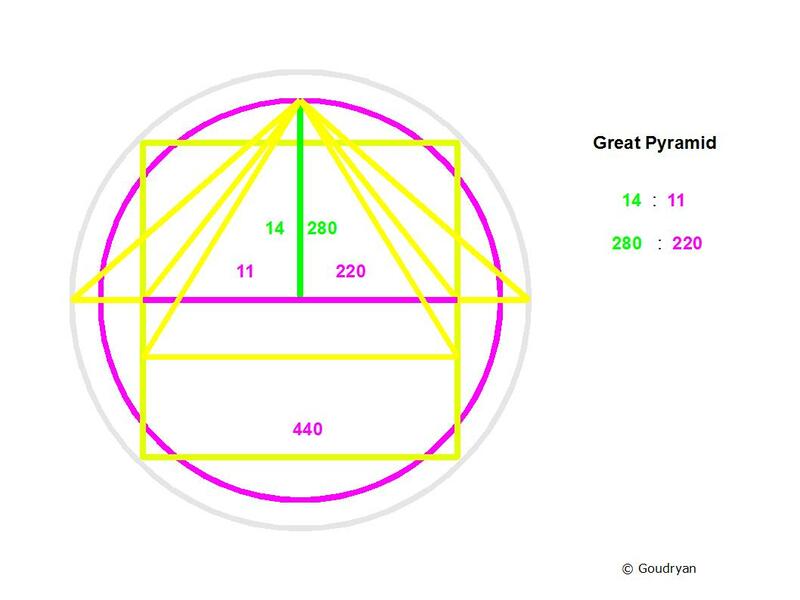 The design data even fit better the Third Pyramid (Mycerinus/Menkaure) which is here believed to have sagged a bit, because of inferior construction, but is meant to be the mathematical key to the Great Pyramid ratios, height is 126 RC = 65.97 m = 126 ME (65-66m, Lehner) = radius of Brodgar moat; the diagonal is 280ME = 396 MR = 146.60 m,(= height Gr. Pyramid, don’t bother the centimetres!! 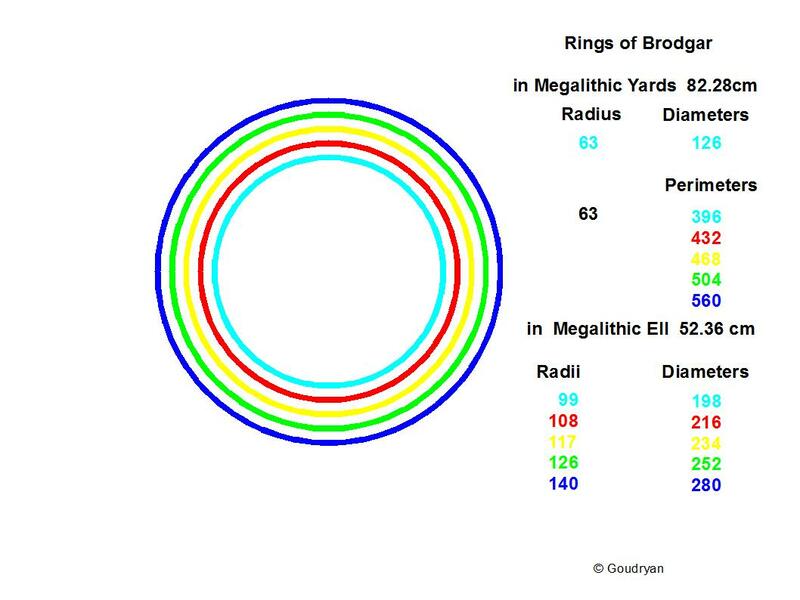 ), the side of Menkaure would be 198 RC = 103.66 m , which is the diameter of Brodgar. Another strong argument for the height of 126 RC for the Third Pyramid is the height of the Second Pyramid at 274 RC = 143.453 m (Lehner 143.50m), since 274 + 126 = 400 RC, whereas 125RC would make 399 RC, a meaningless number. The height of the Second Pyramid, 274 RC, this is 2 x 250V2 – 250V3 = 707.1.. – 433.0… = 274.09 ( x 0.52355 = 143.50!, Lehner), 250 RC is the parallel distance between Great and Second Pyramid. (For lay-out and many other things see the great work done by John Legon). Probably the best argument for the 198ME side and 126ME height of Menkaure is the distance from the King’s chamber floor to the top of the Great Pyramid at 198ME and the level of the air-channel exits at 126ME under the top, the height of Menkaure!, which indicate outside the sides of the Great Pyramid of again 198RC at that level, equal to the side of the Third. 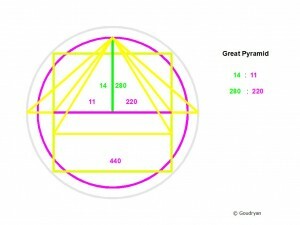 The Third Pyramid is a replica of the top of the Great Pyramid and its prototype theorem. According to our model, the volume of the Third Pyramid is ‘exactly’ 1/11 of the Great Pyramid (diff. 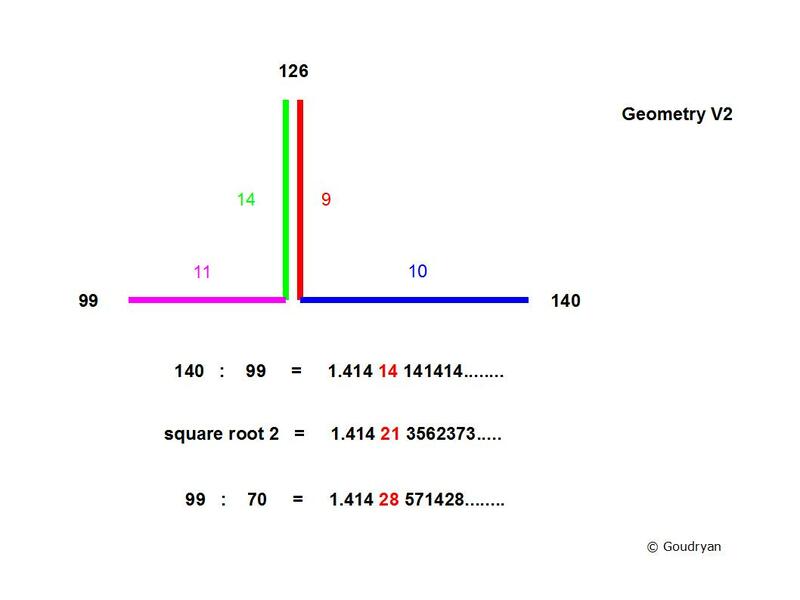 0.025), so the Menkaure-top of the Pyramid has a ratio 1 : 10 with the rest of the Pyramid and a ratio 1 : 11 with the whole, a perfect scale, stressing another time the importance of the number 11 in the design. I will show all this in pictograms in due time.